Sit back and relax and enjoy the stunning scenery in puppy paradise. Our cottages are pet friendly and pets can roam the large shady gardens, enjoy the w alking trails and rocky river - a perfect restful retreat or a romantic hideaway for couples, families and doggy holidays. Spectacular panoramic views of the Bega Valley, with a variety of birdlife, echidnas, platypus, wombats and farm animals. 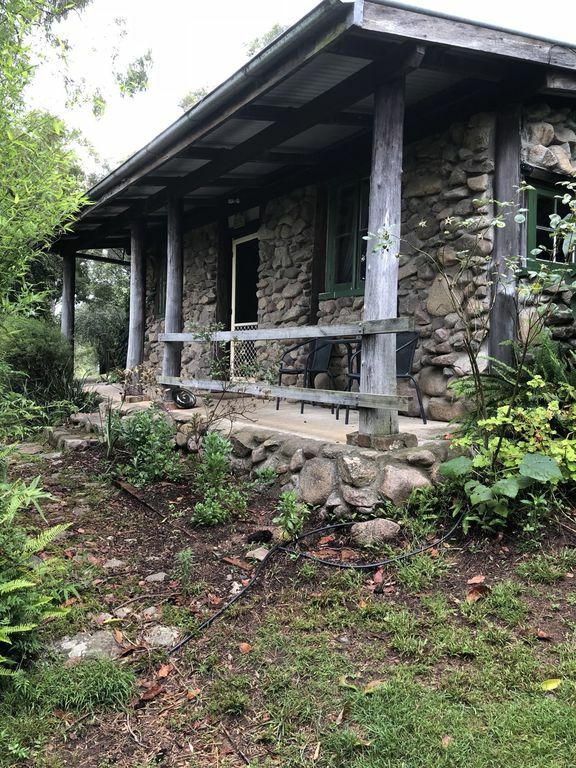 Giba Gunyah means "Stone Shelter" and the original cottage at Benboka River Cottages it is a fairy tale cottage built originally out of timber from the property and large boulders from the river. The cottage, nestled into the slopes of the misty blue ridges of the South East Forests National Park sits high on the bushy hill overlooking lush farming paddocks and the Bemboka River. Sited in a shady cottage style garden, the cottage remains pleasantly cool during the summer months and in winter is made snug with a cosy log fire. Home away from home with luxury linen, cozy wood fires, freshly baked bread and eggs on arrival, starter breakfast provisions, cottages spotlessly clean, budget priced. Bemboka River Cottages is a mixture of cleared paddocks and natural bushland to be explored. There are fire trails and bush walks that continue along the mountain ridge to Bemboka Ridge one way and to the Walls in the other direction. Native flora and fauna are in abundance. The elusive lyrebird, lace monitors, wombats, bower birds building nests, echidnas and of course a variety of parrots and other birds. At the front of the property is the Bemboka River with a large swimming hole and waterfall to explore. Take a walk along the road to Happy Valley and enjoy the beauty and peace of the local countryside with many opportunities for photographs. At night you can go spotlighting and see owls, wombats and possums or just soak up the beauty of the night sky. A nature and bird-lovers paradise with bush trails for nature walks and a natural swimming hole in the river to explore. Enjoy spectacular views, a variety of birdlife, echidnas, wombats, farm animals and large shady fenced gardens for the discerning pet. Cycling, walking, relaxing. Short 30 minute drive to pristine beaches, fishing, cafes and shops and galleries. Locally, on the Sapphire coast, there is swimming, fishing, horse riding, canoeing, grape and fruit wineries, art galleries and craft studios, the famous Bega Cheese Factory, Bemboka Pie shop, Tathra Wharf, Candelo markets and of course whales in season. Our beaches are pristine and uncrowded and there are many leash free beach areas for pets. Trail and bush walks, cycling, stunning rural views, National Parks, Beaches, Swimming,Brogo Dam (canoeing),Weekend Markets, Crafts and Local Produce. Tathra and Merimbula beaches close drive. A visit to the historic wharf at Tathra is a must to enjoy the beauty of the beach and the cuisine of the area. A visit to the Bega Cheese Factory is also a must. Watch cheese being made, visit the museum, café, local craft gift shop and sample the cheeses. There are local fruit and grape wineries to visit, plus local markets each weekend, the most popular of all being the Candelo Markets, which are on the first Sunday of the month. Three quarters of the Sapphire Coast is either pristine Wilderness, National Park or State Forests. You can visit magnificent deserted beaches, sample freshly caught fish at Bermagui and Eden, visit the historical villages of Pambula and Cobargo and their numerous art and craft galleries, take a whale watching cruise (Sept to Nov), go big game fishing, take in a round of golf at one of the many local golf courses or take a joy flight and see how beautiful it all is from the air. Our family of 2 adults , 2 children and our Labrador Billie, recently spent a great 4 nights at this property. The house was everything we were looking for, a bit on the rustic side but with all the things you need for a very comfortable stay. We often visit dog friendly cottages and this property was up there with the best. If you are looking for a quiet , relaxing and private environment this house is it. A compliment to Jeff & Karyn for their hospitality and for going to the extra effort of purchasing new board games for the kids. My husband and i had an amazing time. The stone cottage was more than what we expected it to be. We had some rain during our stay so we got to use the fireplace which made it even more cozy in there. It was the most relaxing thing we've ever done. Karyn and jeff were realy nice and welcomed us with home made bread, which was delicious! Would highly recommend staying here if your looking to get away from your busy everyday life. My partner and I recently stayed in the Stone Cottage at Giba Gunyah and had the most relaxing four day holiday ever! The Cottage, although rustic and with fairly basic cooking facilities, has all the right touches and is extremely comfortable. The garden was in full bloom and very beautiful - we spent hours under the wisteria, drinking wine, reading books and generally chilling out! All this while our very happy border collie ran around the garden and played with the resident pooches who knew the secret entrance through the fence. We spent a day out at Bermagui at the dog beach and another day down at Tathra. We drove home via (sort of!) the Candelo Markets and bought interesting jams and spreads and bakery goods! The fire kept us wonderfully warm at night. We prepared some food at home before coming down and that worked really well. Will definitely return here - I think autumn would be a great time!